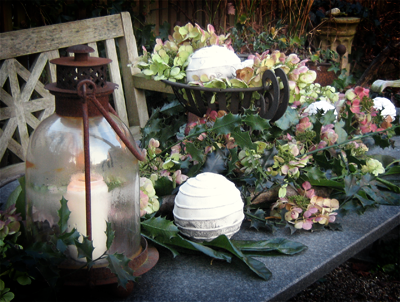 When it's too cold for dining outside the garden table is a great place to show some of your decorative items. Instead of getting lost in some dull garden corners or looking out of place somewhere on the ground especially smaller objects benefit from this small, defined place at prominent level. A bare table looks somewhat inhospitable and boring but can you imagine it brimming with spring bulbs in flower or decorated with moss, peeling bark and rose hips in autumn? Always on my table, my old hurricane lamp is the only one that deserves its name. No matter what the weather is, even in the heaviest of rain or storm the candle inside keeps burning. Unfortunately I don't know where to get another one. If somebody knows, please, please tell me! This winter I wanted to do it simple. Just some twigs and broken branches, a bit of laurel and holly and my old concrete globes which have bleached out over the years. Then I had to cut back a large hydrangea to keep free a garden path in case of heavy snow. The hydrangea flowers were faded but not brown and I didn't have the heart to throw them on the compost heap. 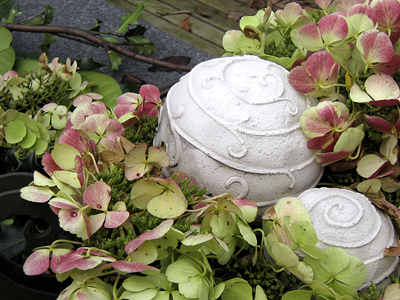 My simple table decoration needed some colour, and so I added these hydrangea flower heads to it. Now it looks opulent and baroque. Completely different to what I wanted – but I like it!